The final preparations are ongoing to deploy the System 001 - a 600 meter long floater that captures plastic waste in the ocean. The Ocean Cleanup is a non-profit organisation funded in 2013 by the then 18 year old Boyan Slat. The purpose of the company is to tackle the plastic waste in the oceans. Now, they are on the verge of launching one of the most ambitious attempts to cleanup the great Pacific garbage patch. The patch is a giant vortex of garbage that spans the largest ocean on the planet, from the west coast of North America to the east coast of Japan. The floating litter accumulates here because of a system of cyclic ocean currents - or gyres. The plastic litter can stay in the oceans practically forever. In the gyres, the plastic does break up into smaller and smaller pieces though. Millimeter sized pieces of plastic gets consumed by the marine life forms. These toxic plastic particles make their way up the food chain, and even ends up in seafood restaurants around the world - which are then consumed by humans. Conventional approaches of cleaning the patch involves using fleets of vessels tugging nets in their wakes to capture the garbage. Such an effort would take thousands of years, and would cost billions of dollars. The solution? The System 001. It is a 600 meter long floater, with a skirt underneath it for the entire length. The skirt tapers over its three meter length. The floater follows the currents in the ocean, and captures any litter in its way. This is essentially sending an artificial coastline into the ocean, where there is none to stop the floating garbage. The floater is shaped like a U so that all the garbage gets concentrated in its center. The floater juts out of the water just enough to prevent plastic from going over it. The skirt below captures the bulk of the plastic, which floats just beneath the surface. The skirt is continuous, and not a net. This ensures that even small pieces of plastic is trapped. At the same time, the skirt prevents marine life from getting entangled or tagged, they can simply swim under or around it. Additionally, it ensures that the current flows beneath the skirt, on which the tiny marine life without the ability to swim, can hitch a ride. There is no artificial propulsion on board, and the floater makes its way through the oceans riding on the natural currents, the wind, and the waves. The trajectory of the floater is calculated by algorithms ahead of the deployment. There is an energy system on board to capture solar energy for the lights and on board Automatic Identification System - a satellite based system to keep track of vessels in the ocean. There are also two high definition 360 degrees cameras in the middle of the floater, for remote real time monitoring. There are lanterns and navigational beacons to alert any vehicles in the area. There is not much traffic in the great Pacific garbage patch anyway. The floater and the skirt are built to be long lasting and robust, to endure any conditions that the sea can throw at it. The engineers considered extreme cases that occur only once in a hundred years. The main reason for the hardiness of the floater, is how flexible it is. Even when faced with five meter high waves, the floater simply floats over these waves. A system of sensors along the entire length of the floater makes sure that it is functioning as expected at all times. The garbage is cleaned up periodically by oceanic “garbage trucks” - ships that visit the floater and collect the garbage trapped by the floater. The actual collection is a manual process, which ensures that there is no marine life that is picked up along with the garbage. The collected plastic waste is brought back to land, and sold to recyclers. Time Magazine called the “ocean vacuum cleaner” one of the best inventions of 2015. The System 001 is the first operation by the Ocean Cleanup. The initial plan was to create a moored barrier, permanently anchored in the ocean. 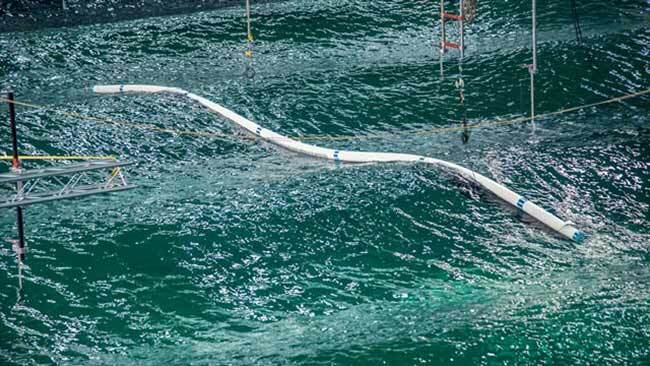 A feasibility study showed that a moving floater would allow the ocean to clean itself up. The next step was to raise funds through crowdfunding on the ABN Amro’s Seeds platform. A total of US $2,154,282 was raised, making it one of the most successful non-profit fundings. There was a number of tests in the North Atlantic and the North Sea, and the design was improved over these iterations. On September 8, the first cleanup operation of the System 001, nicknamed “Wilson” will launch from the San Francisco Bay. 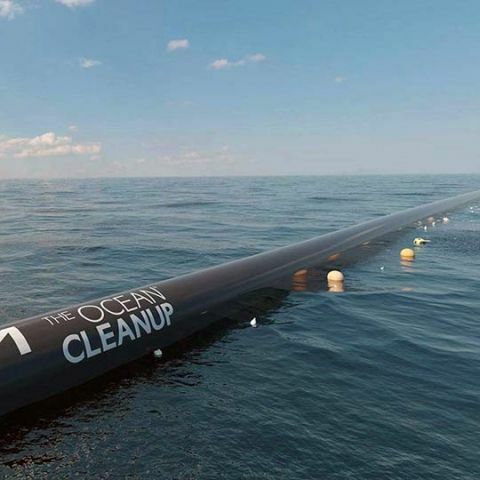 Wilson will make its way towards the Pacific garbage patch on its own from there. The launch will be livestreamed. More information is available on the launch page. The September 8 launch is just the beginning of the cleanup operation of the Pacific garbage patch. The floater is scalable, and eventually the organisation wants to deploy 100 kilometer long floaters. The skirts on these floaters will continue to have a length of 3 meters. In 2020, the team plans to move up to tackling garbage in the oceans worldwide. The eventual aim is to reduce up to 90 percent of the plastic waste in the ocean by the year 2040, and completely remove the plastic by 2050. Going by simulations, a rollout of the 100 kilometer long floaters would clean up 50 percent of the plastic in the Pacific Garbage patch as early as 2023. What is the difference between a regular bitmap and a nine-patch image? Which is the best smartphone under 12k with the best camera and as a great gaming device? Is the canon 70d good to shoot a wedding will the crop sensor be a problem? Want to Buy a Smartphone with Great Camera Features. The best time to buy a smartphone. ?